I’ve really got into wearing watches since starting Sixth Form, I tend to avoid looking at my phone for the time while in lessons so I don’t get distracted by the ever so distracting twitter. I’m pretty sure my heart breaks a tiny bit every time I realise I’ve forgotten to put my watch on. 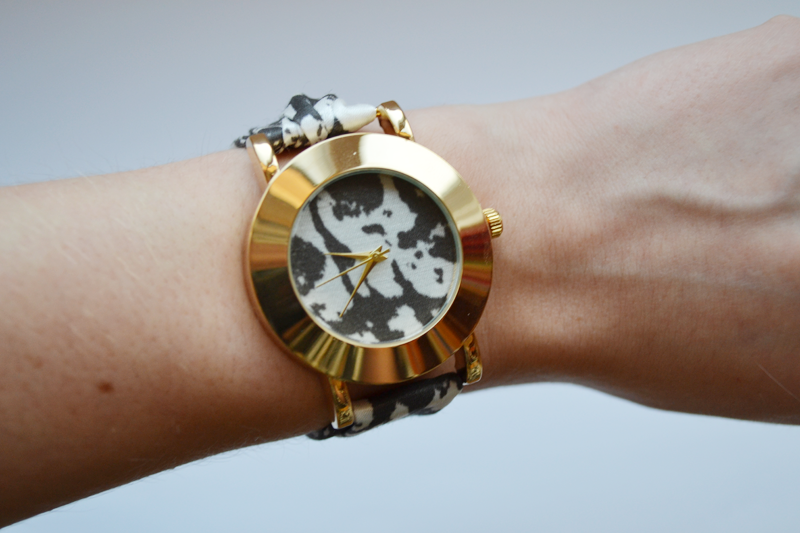 Recently I was contacted by Wholesome Bling introducing me to their Fabric watches. They aim to provide “affordable bling (a state of mind rather than accessories) to fashion-conscious people, who truly appreciate a cup of tea with their nan” and boy oh boy do they do that. I jumped onto the website to pick out what watch I wanted to try out and I decided for the simple monochrome skulls one. They have eight different designs, each come in the small or large face, mine being the larger face. Every strap is hand stitched and prices range from £22-24. I received the watch carefully packaged a few days later and literally ‘awed’ out loud when I opened it. 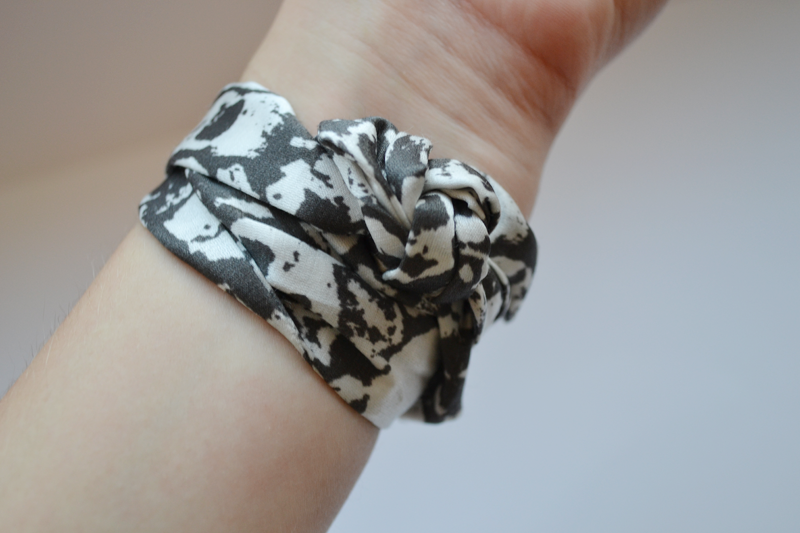 It was wrapped ever so cutely in some tissue paper and a little ribbon. It was so pretty I had to photograph it before hand, and made my brother take some snaps on it seeing as I couldn’t get up thanks to a doggie snuggled up asleep on me, it’s a well known fact you can’t disturb sleeping animals, even for a blog post! Every watch comes in an even cuter jam jar which I love and am currently trying to figure out what I can use it for! Onto the watch.. it’s so gorgeous, the face is big and clear, easy enough to read despite it being numberless! The gold makes it very glam and the silk fabric print makes it so unique. With christmas coming up, I really think this would be the perfect gift! 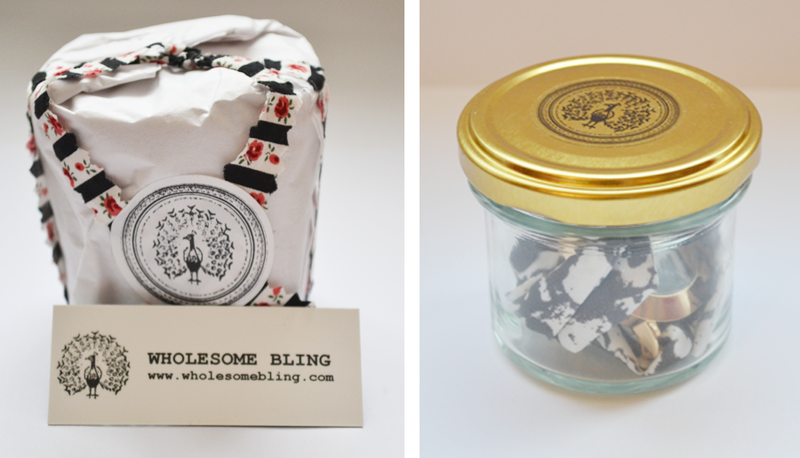 Even better, to celebrate the launch of it’s new website, Wholesome Bling is offering 10% off until 20th December, just use the code ‘New10%off’ at the checkout! "Under £10 stocking fillers for him"
"Under £10 stocking fillers for her"